UW Health at The American Center opened in the Summer of 2015. 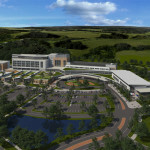 The three story 496,000 square foot structure offers inpatient and outpatient care in a family centered environment. Healthcare Technology Corporation was contracted by J.H. Findorff and Son, Inc. to provide the mounting systems required for 11 new surgical suites. 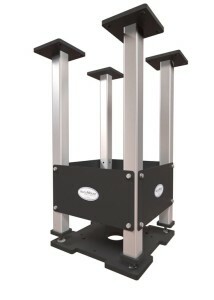 Accu-Mount Support Systems were supplied with our pan joist attachment hangers. These special hangers, along with our header support members, work in conjunction to allow the mast assembly to be easily positioned anywhere between two concrete joists. A total of 56 Accu-Mount Support Systems designed to accept Stryker single and tandem configurations were supplied. Installation drawings and assembly details were provided to allow the on-site trades to safely and easily install the Accu-Mount Support Systems. Since field welding and fabrication were not required, installation was much quicker than build-on-site systems.